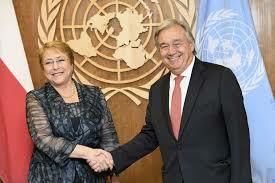 United Nations Secretary-General António Guterres, following approval by the General Assembly, has appointed Michelle Bachelet of Chile the next United Nations High Commissioner for Human Rights. [Ms. Bachelet ended her second four-year term as President of Chile in March 2018, having already held the position between 2006 and 2010. The first woman elected to Chile’s highest office, after her first term, she joined the United Nations as the first Executive Director of the newly established United Nations Entity for Gender Equality and the Empowerment of Women (UN-Women). A long-time human rights champion and ground-breaking leader, Ms. Bachelet is a paediatrician who began her Government career as an adviser in the Ministry of Health, rising quickly to become the first woman to lead Chile’s Health Ministry in 2000 and its Defence Ministry in 2002. Ms. Bachelet became involved in Chilean human rights activism in the early 1970s. She and her parents were political prisoners, and her father, a general in the air force, died in prison. After their release, Ms. Bachelet and her mother spent several years in exile. She returned to Chile in 1979.] Her human rights background as well as her political cloud and experience give reason to hope that the Office of the High Commissioner will continue to be at the forefront in spite of the countervailing currents at the moment. On Monday 20 August the U.N. High Commissioner for Human Rights Zeid Ra’ad al-Hussein said in a wide-ranging interview days before his four-year term ends that U.S. President Donald Trump bears “a heavy responsibility” for how the media is portrayed and that his remarks could have a knock-on effect that could hurt journalists in other countries.” [U.S. newspapers across the country ran editorials last Thursday defending freedom of the press in response to President Donald Trump calling some media organizations enemies of the American people.] “The President should be aware that a heavy responsibility lies on his shoulders when it comes to the way in which the media is being portrayed,” Zeid said. In his last major interview with UN News on 15 August, the UN human rights chief says that the “real pressure on this job comes from the victims and those who suffer and expect a great deal from us.” “Governments are more than capable of defending themselves. It’s not my job to defend them. I have to defend civil society, vulnerable groups, the marginalized, the oppressed. Those are the people that we, in our office, need to represent,” he adds, noting that “oppression is making a comeback”. Graciela Pérez Rodriguez defends the rights of family members of disappeared persons in Mexico. Through her work she attempts to break through the taboos surrounding this issue. The human rights defender is herself searching for her disappeared daughter, brother and three nephews. Graciela Pérez Rodriguez, a non-professional who has immersed herself in forensic science, is a founding member of the Forensic Citizen Science project. This national collective of disappeared persons’ family members in various Mexican states helped establish the Mexican National Citizen Registry of Disappeared Persons and a DNA database run by and for citizens, which facilitates the identification of victims’ remains at a late stage. ‘Despite the difficult circumstances in which she works, Graciela remains committed to searching for disappeared persons in Mexico,’ Mr Zijlstra said. ‘Human rights defenders like Graciela are indispensable in the fight for a better world. It takes pressure from the inside to achieve real change.’ Disappearances are a serious problem in Mexico. Between January and August this year over 2,400 people were reported missing. In mid-October the Mexican Congress passed a new law to combat disappearances, which provides for longer prison sentences and a committee tasked with finding disappeared persons. The Dutch government sees this law as an important step forward in dealing with this problem. The 2016 Human Rights Tulip has been awarded to the Pakistani internet activist Nighat Dad stated the Dutch Ministry of Foreign Affairs today, 6 November 2016. Ms Dad is a staunch defender of digital rights and the importance of protecting women and girls and marginalised groups on social media. Mr Koenders hopes that this prize will serve as a gesture of support for the freedom of internet users, especially women. In 2012 Ms Dad founded the Digital Rights Foundation, which supports female internet users in the form of digital security training courses, public awareness campaigns and the newly created Cyber Harassment Helpline. Ms Dad’s approach enables her to reach women throughout Pakistan, including those in more remote areas of the country. She was awarded the Atlantic Council Digital Freedom Award 2016 and was among six ‘next generation leaders’ named by TIME Magazine last year. Foreign minister Bert Koenders will present her with the prize on Saturday 10 December, Human Rights Day, in The Hague. 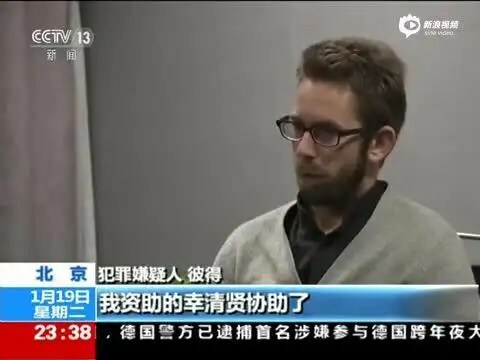 Cases the CUAWG have worked on include that of Qi Chonghuai, a journalist and writer who was imprisoned for reporting on Communist party corruption, and Tulip Award winner Ni Yulan, a lawyer who opposed illegal demolitions and was beaten, harrased and imprisoned by police. On 10 December the 2015 Human Rights Tulip was awarded to IRA-Mauritania, an organisation from Mauritania that is working to abolish slavery. The Nethertlands Minister of Foreign Affairs, Bert Koenders, presented the €100,000 prize and the accompanying bronze tulip sculpture to Abidine Merzough, the European representative of IRA-Mauritania. Thousands of people in Mauritania are living in conditions which could be described as modern slavery. Many are born into and grow up as part of a household in which they receive no pay for their work. Often they are also mistreated. What’s more, they are prevented from owning land, attending school or participating in politics. The most common victims of such abuses are women and children. In August this year slavery was made a crime against humanity under Mauritanian law. Mr Koenders said that the Netherlands welcomes this positive development and pointed out how important it is for the Mauritanian authorities to enforce this law. At the request of the Ministry of Foreign Affairs, the Dutch NGO Hivos will also support the organisation’s activities. Ugandan Margaret Sekaggya is to chair the jury. She is a human rights lawyer who from 2008 until 2014 was UN Special Rapporteur on the Situation of Human Rights Defenders. She is the founder and Executive Director of the Human Rights Centre Uganda and sits on the Board of a number of NGOs, including True Heroes Films. Ales Bialiatski is a distinguished human rights defender from Belarus and the founder of the Viasna Human Rights Center. Nicola Jägers is a professor international human rights law and her research is mainly focused on the expansion of trade beyond borders and the universaling effects of the human rights movement. Shahzad Ahmed has made his voice known by fighting against online censorship in Pakistan. Amira Yahyaoui is a Tunisian blogger, activist and founder of the NGO Al Bawsala. Nominations for the 2015 Human Rights Tulip award for human rights defenders are now, Monday 15 June, welcome. For more information on this award see: http://www.brandsaviors.com/thedigest/award/tulip-award. Deadline for nominations 16 July, to tulip@hivos.org which is hosting the logistic secretariat. There is a short video on https://www.youtube.com/watch?v=cD3KD-jniuM can help encourage people to nominate. Please see also: Home | Human Rights Tulip. The Human Rights Tulip award ceremony will take place on December 9, 2014, at the Ministry of Foreign Affairs, Bezuidenhoutseweg 67, the Hague, in the Netherlands. Starts at 15h45 and closes at 18h15 with a reception. The event is open to the public but on invitation only and those interested should contact the organisers first: ceremony[at]humanrightstulip.nl before 2 December. For more information on the award: http://www.brandsaviors.com/thedigest/award/tulip-award.